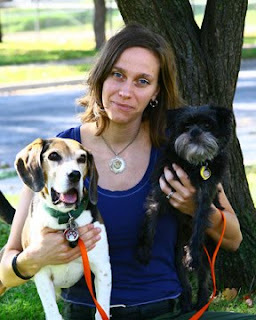 Back in 2009 Dallas Rising, and her dogs, Max and Warren, were guests here on the blog. What's each dog's proudest moment so far? His most embarrassing? I honestly don't know about "proudest" or "most embarrassing" but Max was pretty darn happy when we accidentally bought some soup that had bonito (fish flakes) in it. I started to cook it and it didn't smell right. Rather than waste it, I let Max eat the whole pot of it and he was pretty darned happy about that. And round. Warren has broken his leg twice and he limped for quite a while after getting a plate and several screws put in after the second break. Needless to say he got a LOT of pampering when he was recovering. He will walk beside me on a walk sometimes to solicit a treat ("Look, Mom, I'm heeling so perfectly!"). Brandon had him on a walk and Warren tried "heeling" for a treat - he prances next to your ankles while looking up at you with a huge smile. Brandon isn't the sucker I am and wouldn't give him a treat, so Warren picked up a leg and started limping. Clearly saying "I'm cute and pathetic, where is my treat?" He sure knows how to manipulate mom and dad. Read the complete Q & A.
Omd, that is just too funny! Love it!